Trying to talk about tomatoes can start a fight. First, there’s the pronunciation argument, and then there’s the, “Is it a fruit? Is it a vegetable?” one. Growing tomatoes, on the other hand, is probably a lot easier than you think. 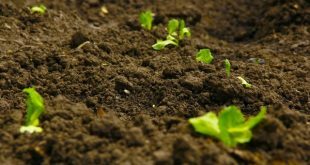 You need to decide if you’re growing them in the ground or in a container. If you think you’re too limited for space even for containers, you may be tempted to try one of the upside down tomato kits, but we don’t recommend those. They usually don’t live up to the advertising hype. Try to be creative and utilize space that might not have occurred to you before. I’ve seen plants thriving on fire escapes and in front yards, so you may have more room than you think. There are advantages to both methods. A container garden is portable and you can put it anywhere that receives a minimum of seven hours of full sun per day. Regardless of what you do with your plants, that seven or more hours of sun is more crucial to growing tomatoes than anything else, except watering. 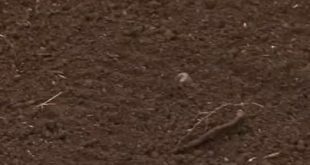 In the ground, the tomatoes can spread out, and I’ve found we have larger plants and grow more tomatoes if we give them some room. I also have an easier time keeping them watered well, because while it’s easier to see when you’ve soaked a container (the water runs through the drainage holes underneath), I’ve found that containers also dry out quickly. If you live in a hot place, or they’re in the sun most of the day, you will need to water more than the average grower. In order to ensure your tomatoes are watered correctly and the water is reaching the roots instead of being wasted on the leaves, there are a few methods of drip irrigation that aren’t even slightly complex, and don’t require you to have a hose all over the place. In our garden, we use stakes that are attached to a 2 liter soda bottle with the bottom cut off. Push the stakes down as far as they’ll go, then fill up the soda bottle with water. These are pretty easy to find at a gardening center. If your eye is drawn by ones that are pretty glass globes, save those for your flowers. Tomatoes are too thirsty to care much for beauty! If you’re handy with a drill, you can use a PVC pipe that is 1″ wide and about two feet tall. Drill holes 1/8″ along the length of the pipe and leave about two inches at the top undrilled. Nestle this in among your tomato’s roots and fill the pipe with water. This method is definitely cheaper than the soda bottle method, but they’re both practical ways of taking care of thirsty tomatoes, so just pick whichever you like best. Next to watering, the most important things are space, support, and fertilizer. Always leave at least two feet of space between tomatoes. Plants can become very large and they need room to breathe and enough room to establish a good root system. Everyone has seen a tomato cage before, even if you’ve never touched a garden. The most common ones are are made of wire and cone shaped. They usually have three or four wires wrapping around the cone. While your tomatoes are getting established, take care to do a little weaving so the plants stay in or near their own cage and don’t start visiting their friends. Tomatoes generally prefer a balanced fertilizer, and ideally you should use one specifically for tomatoes with a NPK ratio such as 8-32-16 or 6-24-24. If you can’t find a tomato fertilizer, use a general gardening fertilizer and do not let lawn fertilizer anywhere near your garden. The fertilizer should have instructions on how much it should be used on the bag or container, and you should follow them. If you compost or have access to compost, I highly recommend working it lightly into the soil around your growing tomatoes every three weeks or so as a top dressing. It’s better for the environment, because there is no fertilizer run off when it rains or you’re watering, it will improve the soil structure of your garden and it’s free if you are interested in doing your own composting, or fairly cheap if you buy it from someone else. 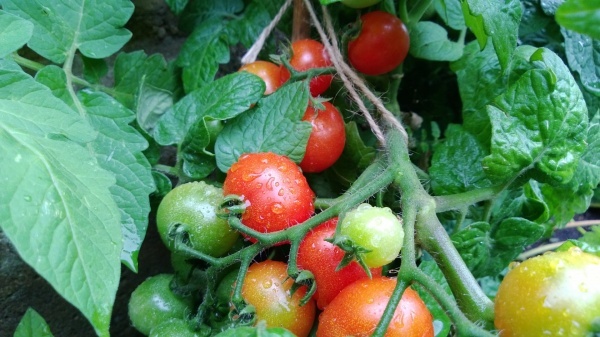 There are all sorts of other things to discuss about ideal growing conditions, but as long as you give your growing tomatoes sun, water, and some fertilizer, they’ll produce beautifully for you, and next year you can get more complicated!